3. Neon argyle socks?! Don't mind if I do. 4. Fun fact about me, I only drink water. And lattes. And wine. But sodas and juice just aren't my thang. I was pretty hooked on Diet Coke and Diet Iced Tea Snapple (peach flavor) for a while, until I realized they are chalk-full of cancer-causing aspartame. No thank you. And while I like a glass of OJ whenever I feel a cold coming on, it's just too sugary for me. Well, I recently I received a coupon to pick up a free bottle of Trop50, and after researching that it does NOT have any unhealthy artificial sweeteners, I figured why not? So readers, I'd like you to meet my new most favoritest drink. No aspartame. Half the sugar of usual Tropicana juices. And my favorite flavor - Raspberry Lemonade - comes in a perfectly happy and bright shade of pink. What's not to love? In other news, Trop50 is actually running a fun campaign called True Resolutions. And the idea behind it is "What's the real reason for your new year's resolution?" Ya know, things like "I want to lose ten pounds... so I look amazing when I run into my ex," and "I want to start my own business... because I cannot stand the people I currently work with." Which led me to think... what are the real reasons for my five goals? Well, I'll let you all in on a little secret. My place is being photographed for a print shelter magazine this year. I know. Whoa. But since photos of my apartment have circulated around the internet, I want to change it up as much as possible without going into crazy debt so that it looks different for this feature. And that my friends, is the REAL reason behind New Year's goal #2: adding more bright colors to my home. What are the real reasons behind some of your new year's goals? Come on, we're all friends. You can be honest! Love the socks- and good luck with changing up the apartment! Those hand towels are adorable! I am like you.. only water, wine and lattes... water mostly, wine in dinners and lattes for the road or friend gathering... the real reasons for my goals.. mm.. decorating my home... so that friends and readers can see it, probably like it and ask me to help them.. that is the reason behind one of my goals :) many others on the list! I love your boldness with that sweater! I don't know if I'd be able to pull that off, good for you! One of my goals is to become more organized, mainly because I really need it and want "clutter" out of my life. I'm headed towards my first job (which is why I'm really excited for The Everygirl to launch!) and I figure that organizing myself now will serve me well for the rest of my life, hence making me happier and less stressed! I'm loving the neon sweater with the hunter pants -- super lovely! The chevron towels are also to.die.for. Well done! I'm indesparate need to add some color to my woredrob and home! I'm gonna have to try the Trop50...I'm addicted to Diet Coke and looking for a good alternative! Thanks for the tip! Good luck with changing up the apartment! How sweet is that Will for doing that for you, so nice! Congrats on the feature! And nop, I really don't have a secret agenda when it comes to New Years resolutions, my goal right now is to be in the top 3 at every race I run...I know I'm boring! Those towels are so fun and lovely! I can't get enough of that Trop50 either. Great job sticking to your new years resolutions! you look cute as ever in that neon sweater! But why is it that I want to work out and get in really good shape? I want a new neon bikini for a Florida wedding wknd in May, and I can only do that when I've tightened up! What!?!? I had no idea there was an H&M home, too bad there's not one here :( Those are some fierce towels! Can't wait to see how you change up your apartment! 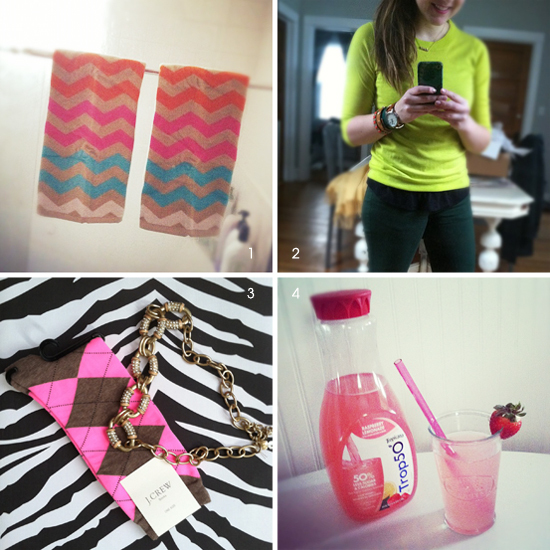 And LOVE those chevron towels. Congratulations on the upcoming photo shoot! I am mega-jealous that you were able to get those hand towels from H&M Home.. I really want the matching throw pillow! Cute green outfit, too! Alaina, my very best regards to you and Danielle with new project TEG. I hope everything goes better than you can imagine. Add some Asti to that Trop50 Pink Lemonade, it's a refreshing little cocktail!